Established in 1993 as a self-help group. 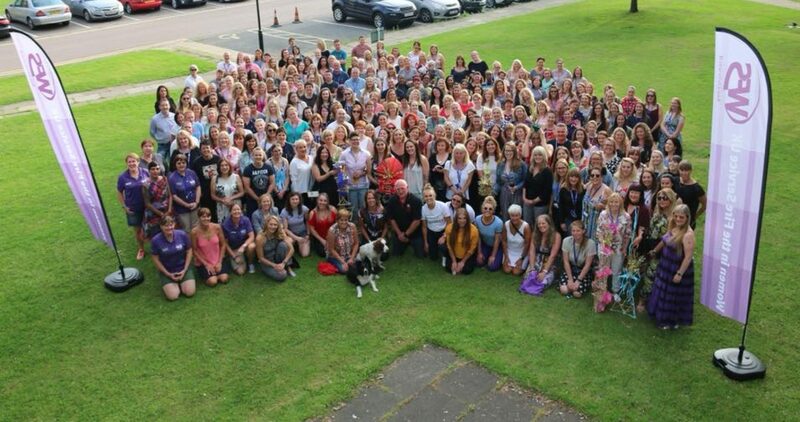 Our members (women & men) come from all roles across the Fire and Rescue Service, from ﬁre ﬁghters and control staff, administrative and support staff & senior officers, to members of airport, defence and works ﬁre services. Since its formation, the membership have sought to influence the equality agenda, taking active roles in research, for example into women’s ﬁt ﬁre kit, supporting positive action initiatives, working with the government in nationwide campaigns for recruitment and playing a part in national groups with other stakeholders. WFS is recognised nationally, currently holding a seat on the Fire Sector Federation, amongst other inputs to the local and national agenda. We are delighted to announce the booking system is now open for our Training & Development event in June. We have a great variety of workshops for operational and support personnel that will give delegates new opportunities to learn, develop and share experiences. Don’t miss out …………Book now! The fee to attend is £440 per person with 10% discount for Corporate Affiliate Members. Closing date for bookings is 20 May 2019. We have successfully completed four Women’s Development facilitated by Emma and Jenny from ‘Women to Work’, in Humberside Fire & Rescue Service, London Fire Brigade, Cambridgeshire Fire & Rescue Service and East Sussex Fire & Rescue Service. The next programme started in January hosted by South Yorkshire Fire & Rescue Service. Those wishing to attend must have the support and be sponsored by their Fire & Rescue Service. Authorisation will be required by email to WFS. 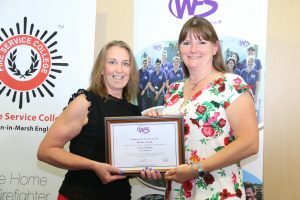 Do you know a person and/or organisations that has given significant support to the WFS or has made a positive contribution to support women working within a service, and to individual women who have achieved particular success within the Fire and Rescue Service. To find out more visit the Awards page. 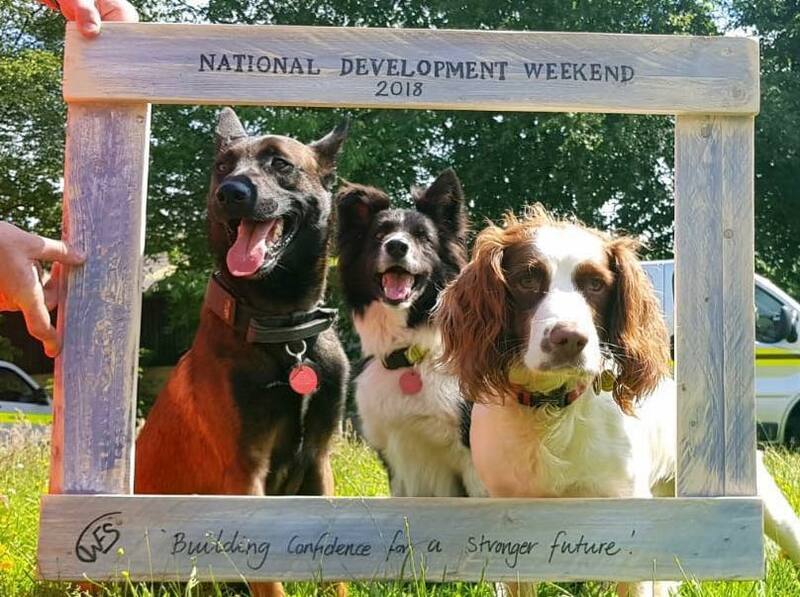 The 18th Training & Development weekend took place at the Fire Service College on 8-10 June with the theme ‘Building confidence for a stronger future’ and what a fabulous weekend it was with 214 delegates attending from over 30 National Fire & Rescue Service, RNLI and International delegates from The Netherlands and Sweden. Our inspirational speakers at the Friday opening ceremony were Dany Cotton, Commissioner of London Fire Brigade and Moira Cameron, Yeoman Warder of the Tower of London. 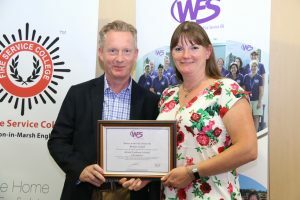 We were delighted to present WFS Awards to Kathryn Billing (Bronze), Steve Taylor (Bronze) and Bristol Uniforms Limited (Bronze). Congratulations to all. A special award was presented to Siren Sisters for their success in the UKFSC in May – full review on UKFSC page. 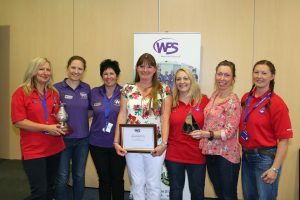 Dany Cotton presenting a special award to some of the Siren Sisters team, who were attending the Training & Development weekend. A huge thank you to everyone who attended the training weekend as delegates, facilitators, instructors, all the FSC staff, the WFS Team and the fire services who supported delegates attendance.